Teflon, the compound used in nonstick cookware, was discovered by accident in 1938. In addition to its use in cookware, Teflon’s nonstick properties make it useful in a variety of other contexts, such as waterproof apparel, lubricants and medical devices. 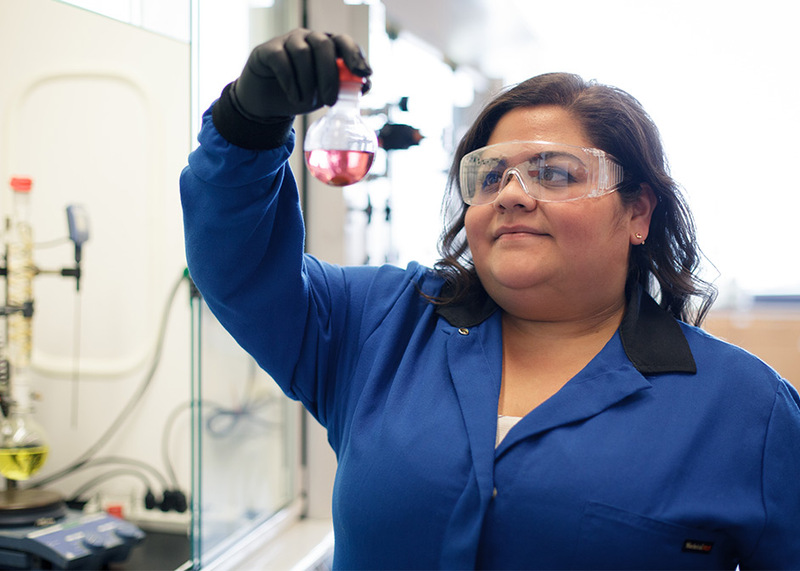 Maria Marquez (’11, Ph.D. ’17), spent her time as a University of Houston chemistry graduate student synthesizing and characterizing materials with properties similar to Teflon. Her research was conducted in the lab of T. Randall Lee, Cullen Distinguished University Chair and Associate Dean of Research for the College of Natural Sciences and Mathematics. Marquez’s research focused on fluorinated thin films. Uses for thin films, which she applies to metal surfaces, include corrosion inhibition and lubrication. To put that in perspective, one nanometer is one-billionth of a meter, with the diameter of a human hair measuring 75,000 nanometers. With organic thin films measuring two nanometers, their uses are applicable to a variety of applications such as electronics. Marquez is interested in the wetting properties of these materials. When a liquid is applied to the surface of these films, will it spread out or bead up? Depending on the answer, these materials can have applications in different contexts. As the first person in her family to go to college, Marquez was a path-breaker, someone responsible for figuring out everything from where to buy books to how to juggle classes with work. While working on a bachelor’s degree in chemistry at UH, Marquez found herself drawn to organic chemistry. After working in a lab, she decided to pursue graduate school, enrolling in a Ph.D. program. Along the way, Marquez’s excellence in research was recognized with multiple scholarships from the Society of Tribologists and Lubrication Engineers, as well as an Outstanding Student Poster Award during the 2017 American Chemical Society’s national meeting.